Our visits to David’s boat at Thurne in Norfolk during the summer gave us the opportunity to visit the North Norfolk Railway (the Poppy Line), Oxburgh Hall and Gressenhall Farm and Workhouse. We chose a good time for a trip on the North Norfolk Railway (NNR) as, on that hot, sunny day in early summer, the poppies were in full bloom. This Poppy Line ran from 1887 until that Beeching Axe* in the 1960s put a stop to its genteel journeys through the beautiful countryside along the North Norfolk coast. It is possible to make the 10.5 mile round trip between Sheringham and Holt now thanks to the volunteers who rebuilt the line after the NNR was founded in 1965. At Sheringham we were grateful we had time to buy an ice cream (for David) and a fruit ice for myself before the apple green steam engine (a B12 8572 built for the LNER in 1928) set off for Holt. As the train pulled away we had a very interesting visitor – Tilly the Cockatiel (above). 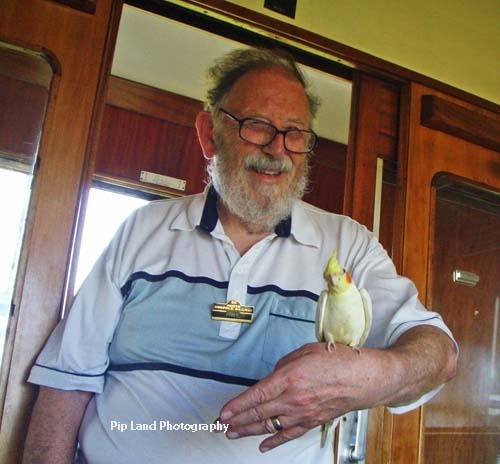 She posed very happily on Roger’s finger, while he explained that she was a bit blind and very happy to travel with him while he worked as a volunteer on the railway. Like the other heritage railways we have visited it is the helpful and cheerful volunteers who make the Poppy Line so enjoyable and successful. The atmosphere of the old carriages was enhanced by the clackety-clack of the riveted tracks with their expansion joints. Those expansion gaps made for noisy and bumpy rides that the modern steel rails on mainline railways don’t have. Instead on hot days lines are closed due to buckling. There was no danger of that on the Poppy Line. The lengthy stop at Weybourne gave us time to remember the crazy antics of Dad’s Army in the episode The Royal Train filmed there in 1973. But as it was so hot we were grateful when the train was under way again, puffing its way uphill through woods and rare open heath land to Holt. We took time out there to view the model railway and the 132-years-old station building which volunteers had moved brick by brick from Stalham in 2002. The signal box is also over 100-years old. In the buffet David bought a very good homemade sandwich but I, with my food intolerances, couldn’t have anything. David’s big find of the day was Ben Shaw’s Cream Soda. What a taste from the past! We sat outside in the shade and enjoyed the cool breeze before exploring the small museum. On the return journey our train was pulled by a diesel engine which provided us with a very different experience. We sat at the front of the first carriage so that we could get the driver’s view of the countryside which has been designated as being of outstanding natural beauty. 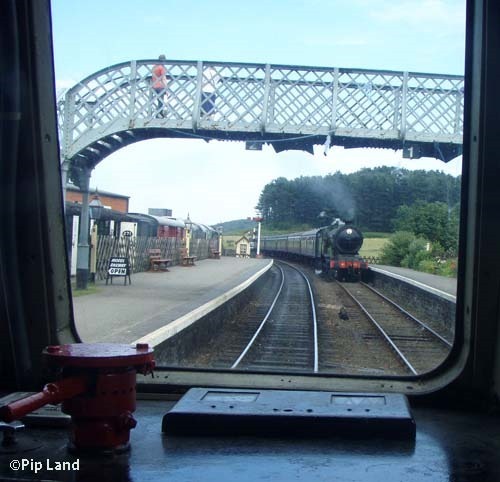 Below – the Diesel engine waits for the steam engine to arrive. Back at Sheringham David had time to sit and reflect while I walked past the connection to the mainline railway and went hunting for food in the town centre. One large ripe banana from a traditional green grocer did the job. The weather couldn’t have been more different on the Bank Holiday Monday at the end of August – it poured with rain all day. 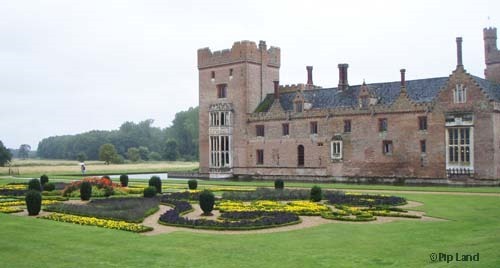 So the first thing we saw as we entered Oxburgh Hall near Swaffham was lots of wet umbrellas for it takes a few minutes to walk from the car park. We were impressed by the beautiful parterre – the flower bed laid down in the Victorian era and full of vibrant colours offset by dark green yew bushes (below). But like others we hurried on across the moat bridge, through the courtyard and into the half of the hall which was open to visitors. On such a cold, wet day we decided the best way to start would be in the tea room where the staff were so helpful and very willing to prepare me a salad that avoided all my intolerances. David gave top marks to their lemon, orange and lime cake. Well pleased with our meal we set off on our tour of the hall which was built around 1482 by Sir Edmund Bedingfeld. The Bedlingfelds family still lives in the East wing overlooking the parterre even though the hall and surrounding gardens were given to the National Trust in 1952. We and many others are able to enjoy visiting this grand Tudor house thanks to three determined female members of the Bedlingfeld family who sold their own homes so as to buy back the hall from the developer who bought it in 1950. We were particularly fascinated by the way the Bedingfields right from the beginning had found ways to create a grand appearance without spending too extravagantly. There’s the spiral staircase with its imitation brickwork painted onto smooth plaster, and the wooden bed in the North bedroom which was cobbled together from bits of older carved woodwork. Even a carved panel in that room is a composite piece. I was especially fascinated by the display of wallpapers showing how these have changed since the mid-18th century, and the painted leather wall coverings. And then there are the magnificent Marian Hangings – embroideries which were worked by Mary Queen of Scots and “Bess of Hardwick” between 1569 and 1584. When we reached the King’s Room where the priest hole was hidden I wasn’t sure I could get out again if I did somehow get into that space specially created maybe as early as the mid 16th century to hide Catholic priests. So I cheated and let my camera have a look for me instead. We did go into the chapel of the Immaculate Conception and St Margaret which was built in 1835, after the Catholic Emancipation Act which finally brought to an end centuries of intolerance and even persecution of Catholics. The intricate 16th century retable (framed alterpiece) was in sharp contrast to the stark simplicity of the chapel at Gressenhall workhouse. Yet the octagonal apse of the latter, which was built in 1868, has a beauty of its own thanks to the brickwork banding. It was sad to think that it was only at church services on Sundays that husbands could see their wives and children for those forced by poverty to live in a workhouse were strictly segregated. So the boys using the literacy skills they had learnt in the school to scratch their names on the bricks in their exercise yard would not see their fathers until they were old enough to be counted as men. I was also saddened to learn that before the 1834 Poor Law Amendment Act a much more homely regime existed there. The fine building was constructed in 1776 as a “house of industry” where poor families lived in very small apartments or cottages as they were known. These families were expected to be self-supporting mainly by working on the farm. That farm, however, was sold after 1834 and the workhouse became synonymous with degradation and severe hardship. Among those sent to the workhouse were unmarried pregnant women like my grandmother was probably in the 1890s. Those women were kept securely separate in case they contaminated anyone else. However hard such excellent guides as John might try it is impossible to envisage what life was like in such workhouses. 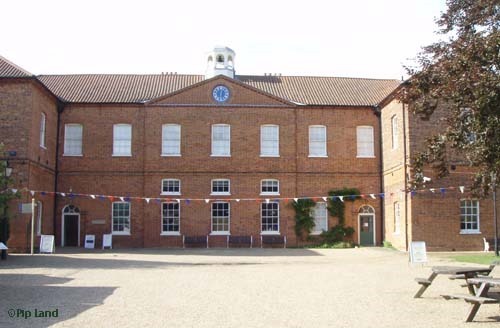 There is plenty to see and experience at Gressenhall as it now houses the Museum of Norfolk Life. There’s the extensive Norfolk Collection on the second floor of the main building where we spent a lot of time reminiscing about what household products our parents had used. Downstairs was some of the machinery which helped drive the industrial revolution and the great changes in agriculture from the 18th to the 20th centuries. I could have spent much longer reading the short biographies of the men and women who had participated in those changes – from the highest to the lowliest in society. A lot of work has obviously been done to provide interesting information for visitors including audio visual and video displays. We visited Gressenhall farm and workhouse the day after going to Oxburgh Hall and the difference in the weather was amazing for it was so warm we were back in light summer clothing. It did mean we could wander round the grounds and visit girls’ school (separate, of course, from the boys’), and the Village Row with its depictions of early 20th century blacksmith’s workshop, grocer’s shop and post office. There was also Cherry Tree Cottage which was built in 1853 to house elderly married couples rather than force apart those who had spent a lifetime together. As part of the museum it has been transformed into a three-room cottage to show how people lived before World War II. David, of course, also wanted to have a look at the 1899 Panhard et Levassor which is almost certainly the oldest car in Norfolk still running. We could have spent a lot longer at Gressenhall museum especially as it has an excellent tea room where the staff, as at Oxburgh Hall, specially prepared a salad for me. These visits made up for the fact that we could do little boating after the engine in David’s Edna May broke down. We did have two lovely days boating with Jim and Sue Bondi and Hilary. 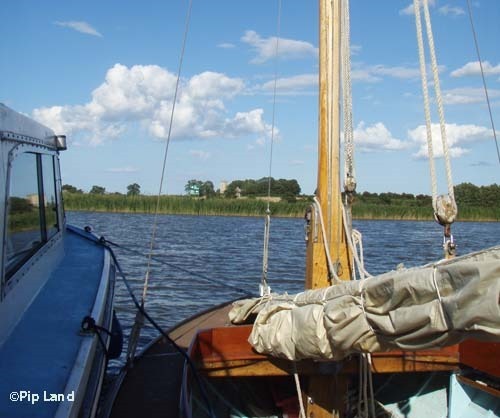 And Jim even took Hilary and me for a sail at South Walsham in the half-decker Elf which he takes care of for Acle Academy sailing club. Below on our way back to Thurne with Elf. They also brought to an end a summer of sadness. *Beeching Axe – Dr Richard Beeching’s 1963 report The Reshaping of British Railways recommended the closure of 2,363 stations and 5,000 (8,000 km) of railway line – and the majority were closed.